White linen pants are one of your summer wardrobe staples, and you love the idea of winter whites making an appearance — just not head to toe (unless you're getting hitched, of course). Well, it's time to get creative with your white wares because there's a secret pop-up dinner taking place this Friday where a white ensemble isn't a suggestion — it's a requirement. 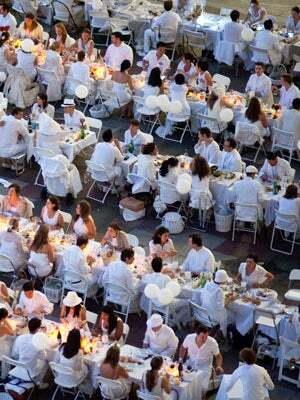 The concept of Dîner en Blanc (diner in white) began a quarter of a century ago in Paris and has then grown to include 24 host cities globally. This is the first year it will take place in Chicago, and needless to say, we're psyched! Oh, and in case you've ever been to a white party before and think this is old news, make no mistake — Dîner en Blanc International is the originator, the real deal, and exported straight from Paris. 1. Like Dîner en Blanc Chicago on Facebook, follow it on Twitter, and register for the wait-list on the official Dîner en Blanc website. The cost to attend it $40 per couple. 2. Those who register will be emailed with specific information regarding times, procedures, what to wear, what to bring, and how to make the most out of the Dîner en Blanc Chicago experience! We'll be there snapping the best dressed, so keep an eye out for our Dîner en Blanc fashion coverage next week!